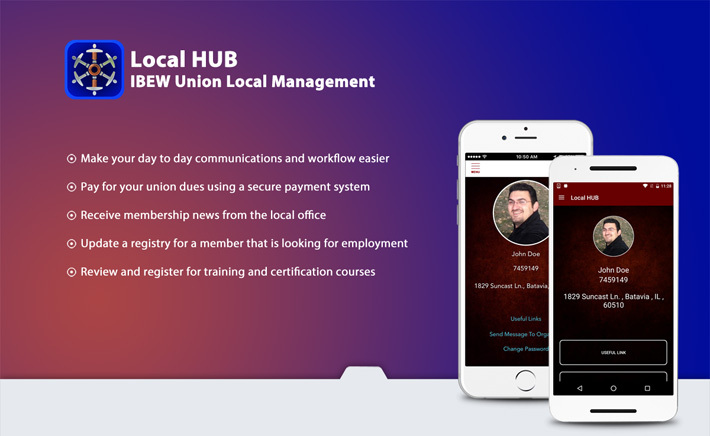 The Local HUB - IBEW Union Local Management App allows an IBEW union member to use their mobile device to make their day to day communications and work flow easier. The member can pay their union dues using a secure credit card payment system, review and register for training and certification courses, review contractor and agreement information, receive membership news from the local office, update a registry for a member that is looking for employment and send information to a designated union member with a specific job duty. The member can also click on useful links for quick access to information and websites that are used daily.